Reach over 16,560 readers of Chiller & Cooling Best Practices by advertising in the print and digital magazine mailing quarterly. A range of ad options, from Full Page Features to Marketplace ads, are available. 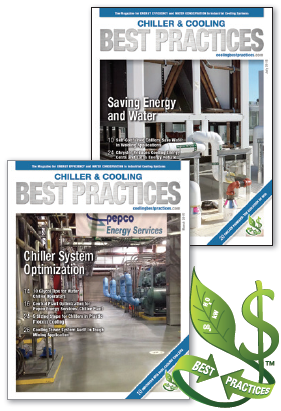 Over 4,800 readers receive the Chiller & Cooling Best Practices e-Newsletter blasting out every month. Benefit from high Open Rates (28%) and Click-Through Rates (24%). Skyscraper and “Text & Image” ads are very effective. Launched in March 2015, www.coolingbestpractices.com serves energy and water-conscious users of industrial chiller and cooling systems. Banner and Boom Box ad space can grab attention at a low monthly rate. For more information on web site and print advertising opportunities, please download our 2019 Media Kit. Please feel free to contact our Advertising Sales Manager, Rod Smith, or tel: 1-412-980-9901. Papermaking Energy Owner - THE P&G Paper Products Co.
Twenty-nine percent (29%) of our 16,560 print and digital magazine readers are energy consultants, utility company account executives, and chiller and cooling system professionals. These readers are chiller and cooling system experts who can advise Energy Managers and execute energy-efficiency projects. Chiller & Cooling Best Practices, the e-newsletter and its’ web site, www.coolingbestpractices.com are wholly owned by Smith Onandia Communications LLC. The Company is based in Pittsburgh, Pennsylvania.